Letting kids eat a lot of McDonald’s is a great way to make them fat. But sometimes parents can’t resist buying food that’s so cheap and addictive. Thankfully, the geniuses at McDonald’s have happily come up with a solution for every potential heart condition that rolls into a Mickey D’s drive-through. 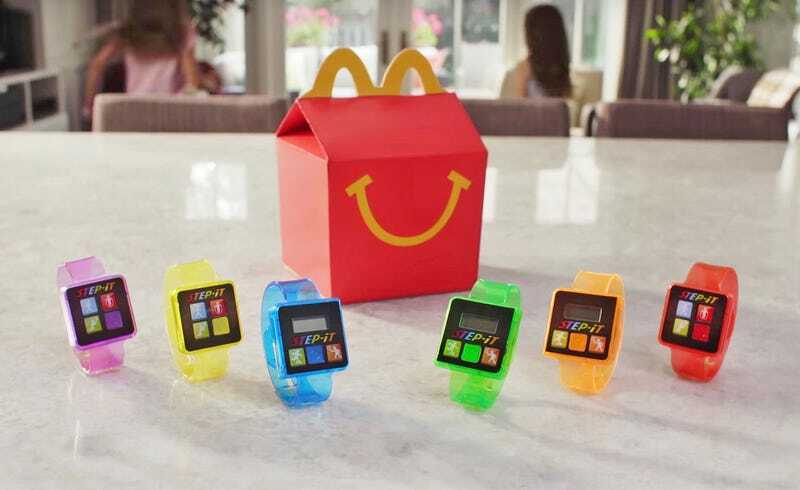 McDonald’s will soon begin shipping a cheap fitness tracker in every Happy Meal sold in US and Canada locations. The “Step-It” tracker is basically a really crappy step counter that also blinks based on the speed of a kid’s steps. The promotion will last four weeks. The tracker can presumably count really, really high—because it takes four hours of exercise to burn off the 840 calories in a single Happy Meal. If you consider that the average person takes about 2,000 steps per mile, and they walk about three miles per hour, that means a child would have to take about 24,000 steps before their grimy cheeseburger meal calories were burned off. My legs (and stomach) hurt just thinking about it. If you’re looking for an easy way to count steps, I wouldn’t recommend running out and grabbing a Happy Meal, either. McDonald’s new wearable fitness tracker provides nowhere near the same level of quality as a Fitbit, and it appears to be made cheap plastic. Even the display is a tiny LCD screen similar to the ones found in cheap digital watches. I guess if you consider that it’s free with a $5.00 Chicken McNugget Happy Meal—it’s one hell of a deal (so long as you don’t include the long-term medical costs of obesity or diabetes). Enjoy that cheeseburger, little buddy!